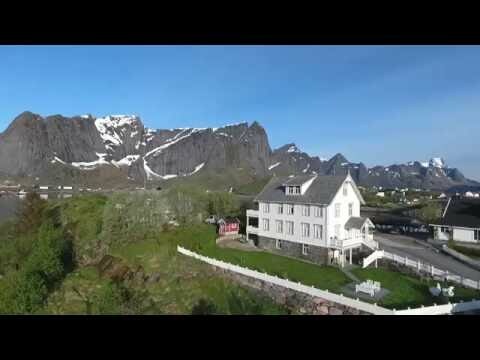 RANDO-LOFOTEN - Should you hike to Reinebringen ? Should you hike to Reinebringen ? Every summer many climbers tackle the climb up Reinebringen on the island of Moskenesøya in the Lofoten archipelago. Many users of this site have asked us why we don’t mention this itinerary in the “Hikes” section. Here is our answer. First of all, we do not consider the climb to the Reinebringen pass to be a hike a such. It is a very steep climb for roughly 1km leading to a small pass with a breathtaking view over the village and fjord of Reine. First of all, there are mountains nearby that have panoramic views that are just as impressive not only from the top but throughout the climb. In our opinion the Helvete hike to the top of Veinestinden is much more interesting than the Reinebringen hike! The same is true of Brunakseltinden or Munkan, for example. The terrain to reach Reinebrigen is getting more and more dangerous. Each year the “track” deteriorates due to the large number of people hiking in an environment that is totally unsuitable. As a result the terrain, which is extremely steep, has become crumbly and ravines have formed. In many places only a few steeply sloping slabs remain that are very dangerous when the ground is wet. On this particularly steep track that is very demanding in places, some “hikers” have created new parallel tracks wherever they consider the previous track too worn out! The mountain side, which has been completely churned up by hikers, is gradually becoming a series of furrows that will encourage landslides and falling rocks. There are rumours that the Moskenes town council intend to develop the path, but so far nothing has been done. While we are on the subject, we would like to remind you, and this applies to all hikes in the Lofoten islands, that in order to minimise the impact of hiking in this wilderness you must stick to any tracks that exist. It is for these reasons, even though we fully understand the pride the locals must feel when they direct summer tourists to the viewpoint, that we do not consider this hike to be vital. For those who nevertheless feel they would like to tackle this climb, the GPX route is available on our website. If you want to go from Forsfjord power station to Vindstad (or vice versa), and you don’t want to rely on the boat shuttle MS Fjordkyss, it is now possible to do it by foot. We provide GPX track, map and the description (in french only) for the section connecting Vindstad to Forsfjord. This new possibility is particularly interesting for hikers engaged in the great crossing of the Lofoten Islands trek. Vindstad to Kjerkfjorden or other way around? Can someone please recommend ..
Rorbu to Rorbu Hiking with few cars, busses & ferries?